Safe to say that few among us cognoscenti have any thoughts but charitable ones towards one-time Greens Senator Bob Brown, the exemplar of an activist politician who always stood on the side of the angels in a parliamentary ambience that was rarely anything higher than murky and usually contemptible and tawdry. 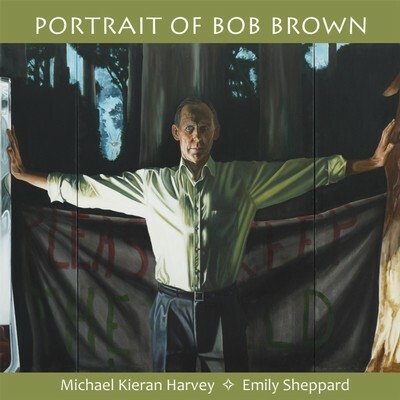 Small wonder that another Tasmanian eminence, Michael Kieran Harvey, should be involved in a musical eulogy to Brown who, though born and educated in New South Wales, has become synonymous in his public life with the island state’s environmental battles. For his homage-of-sorts, Harvey and associate artist Emily Sheppard have prepared three works – two of them original and one a revision. All three are of shortish duration and the CD winds up being considerably less than half the length of a ‘normal’ contemporary recording: Harvey’s title track is 11:16 minutes, Sheppard’s Aftermath for viola and voice is 9:02, and Harvey’s Homage to Liszt reworked for violin/piano duet last for 9:20 minutes. These compositions were all performed at the musical launch of a collection of poems by medical practitioner Arjun von Caemmerer in October last year at the Conservatorium Concert Hall in Hobart. Portrait of Bob Brown gives equal billing to violin and piano, not exactly asking for stamina, although the piece contains a few active bouts, but more an ability to negotiate smoothly a sequence of about five segments, the task made a touch more difficult as the work contains two significant pauses – changes of gear but not suggestive of discrete movements. In fact, the score sounds like a rhapsody, the spirit taking the listener where it wills. If you’re concerned that Harvey is proposing a kind of chamber-scale Heldenleben in which we follow Brown’s spiritual development from Oberon to Cygnet, fear not: the soundscape of this Portrait is non-specific, essentially abstract, non-alliterative and suggestive of a consistent personality rather than a psychological pilgrimage. The work opens with strong pointillist statements from Harvey, Sheppard constructing a firm aria line under which the keyboard moves towards subterranean rumbles. The composer’s language sounds too free and loaded with repetitions to be twelve-tone or doctrinaire but the events that transpire are structured towards an end, in this case from trills and a muffled dialogue to an increase in pace with the piano moving into aggression. As the dynamic changes in both instruments, the pace quickens to a hurtling speed where piano and violin occasionally join in note-for-note duets, sometimes in melodic unison, at other times following each other’s path at close range. Although clearly written out, this writing is reminiscent of Harvey’s volcanic flights of improvisation. A pause leads to a segment suggesting the opening strophes, albeit with a pronounced menace from a two-note tattoo in the piano’s bass underlining the fragility of the violin and keyboard’s right-hand decorative elaborations positioned in a high tessitura. A further change to briskness sees the use of hand-muted piano notes; hard to accomplish, I would have thought, given the pell-mell pace. Another pause before a reversion to the piano’s pointillism – single notes and chords – under the violin’s exposed lyricism and the work ends with a peroration in strong statements alternating with softer joint textures, a gradual recessiveness before the final trill-laden bars for both players. The framework, as you can see, is not over-complex although the instrumental interplay and grafting impresses for its assurance. It leaves its interpretation open; those that want can probably find suggestions of Brown the environmental warrior, the defender of personal liberty, the intransigent proselytizer, the relentless scourge of Parliamentary hypocrisy. But the piece doesn’t really operate on those terms; what it does suggest is a combination of restlessness and quiescence which could apply to any man but seems to suit Brown more than most of us. Sheppard’s work is a lament in what I think is C; could be B, but it sounds more like the former. Its language is unrelievedly minor, even when the composer/executant is playing Major 3rds. The progress of Aftermath sounds improvised, as though Sheppard is following a pattern as far as she wants to, then moves into another emotionally similar path. At a few points, she sings a wordless consonantial fragment above her instrumental accompaniment which itself takes on various shapes throughout the score’s length: repeated arpeggio patterns, orthodox pizzicato and the left-hand variety, two-string unisons, harmonics, trills. Sheppard says the work came into existence at Sarah Anne Rocks on the Tasmanian west coast, ravaged by bushfire in January 2016. Even for those of us who don’t know the area, Aftermath suggests loss and grief, and with a strangely Celtic tinge. Harvey’s Homage to Liszt is better known – well, to me – as a duet for piano and percussion, shorter than this arrangement. In four parts, it takes on the Hungarian composer’s ‘look’, following a varied path of emotional sympathy though a ballade, a waltz, a csardas and that form intimately associated with the composer’s popular face, a Consolation. Harvey takes Lisztian tropes along with direct quotes and creates a formidable edifice; a small prelude suggesting Brubeck in animated mode leads into a Romantically swirling ballade before the waltz’s re-visiting of one of the Transcendental Studies, the brilliantly parodic Hungarian dance that manages to raise the spectre of Bartok as well as mirroring Liszt’s exciting rapid scale-work across the instrument’s complete range, before a token nocturne with a 12-tone melody finishes the piece, reminding us of the composer’s final experimental works where traditional harmony was dissolving. Sheppard’s contribution matches Harvey in enthusiasm and the track is a splendid collaboration where neither performer puts a foot wrong, the many synchronous passages exciting to experience. For all that, I can’t think what it has to do with Bob Brown, except as a an enthusiastic salute to a character that most us would probably remember, if unfairly, as something of a sobersides. The proceeds from this CD are being donated to the Bob Brown Foundation, an organization dedicated to ‘action with a vision to protect Australia’s wild and scenic natural places of ecological and global significance.’ It’s hard to think of a cause more worthwhile in these shameful days when the Great Barrier Reef is being killed off under our eyes and Brown’s successors are ignoring any environmental danger-signs yet wasting their energy in schoolyard squabbles.